In a culture where so many strive for praise and glory, what kind of person finds the greatest reward in anonymous work? Expanding from his acclaimed Atlantic article, "What Do Fact-Checkers and Anesthesiologists Have in Common?" David Zweig explores what we can all learn from a modest group he calls "Invisibles." Their careers require expertise, skill, and dedication, yet they receive little or no public credit. And that's just fine with them. * a virtuoso cinematographer for major films. * the lead engineer on some of the world's tallest skyscrapers. * a high-end perfume maker. * an elite interpreter at the United Nations. Despite the diversity of their careers, Zweig found that all Invisibles embody the same core traits. And he shows why the rest of us might be more fulfilled if we followed their example. David Zweig has writtenfor "The Atlantic," "The NewYork Times," and "The WallStreet Journal," amongother publications. Hisnovel, "Swimming Insidethe Sun," was called a terrific debut from a talentedwriter by Kirkus.As a singer, guitar player, and producer, Zweig hasreleased two albums, "All Now With Wings" and"Keep Going," both of which charted on collegeradio. Zweig has presented his research abouthow media and technology affect self-perceptionat academic conferences and universities aroundthe United States and in Europe. He lives inBrooklyn with his wife and two kids." "A fascinating tour of the hidden landscapes on which human society actually operates. This will change the way you see the world and, hopefully, your place within it." "Invisibles is a one-book cultural revolution, fighting the current cultural tide toward narcissistic self-promotion with the truth that real satisfaction is often silent." 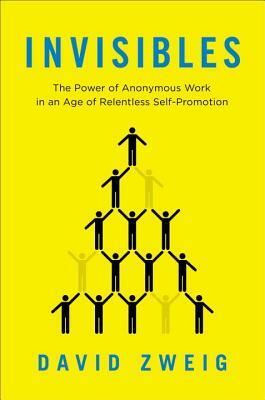 "Top Business Book to Read in 2014: Invisibles explains why some of the world’s most talented, accomplished people choose to fly under the radar… It’s a clarion call for work as a craft: for generously sharing knowledge without hogging credit and prizing meaningful work above public recognition. An excellent book." "The genius at the top doesn’t make their team look good. It’s a great team that makes the guy at the top look like a genius…and Invisibles proves it."